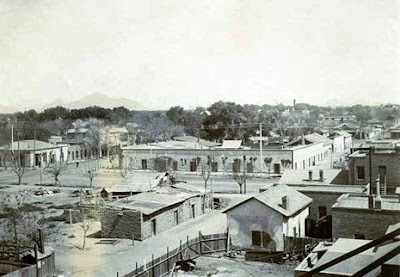 As Phoenix entered the 1880s, violent language and racist laws were common when it came to the white settlers and their treatment of the people indigenous to the valley. The federal government had recently enacted the policy of indigenous peoples' containment to reservations, and the seizure of lands for the interests of business and Euroamerican/white settlers. Akimel O'odham, Pii-posh, Maricopa, and Apache people were regularly scapegoats for white politicians and citizen groups as the cause of social unease, crime, and vice in Phoenix. White settlers, while newly present in the region, organized a mass meeting in Phoenix in September 1881, hoisting a banner which read "Removal or Death for the Apache." The violent and genocidal attitude of whites wasn't just aimed at the Apaches, who had been in anti-colonial armed conflict for thirty years at this point, but even the local people from the Akimel O'odham and Maricopa communities, who were not engaged in armed conflict with the Phoenix colonial occupation, were also treated with hostility and contempt by the state and citizenry. The presence of Akimel O'odham and Maricopa people who ventured into the new cities was detested by the white population, who complained that "lounging about the streets are a great many Indians." In addition, whites gave violent physical and verbal abuse to indigenous people who were perceived as hanging around local landmarks such as city hall, or the train depot. In May 1881, racist and colonial legislation was passed by the city making it illegal for any indigenous person to be on city streets "without sufficient clothing to cover the person", or to be in the city after dark unless employed by a white Phoenix resident. The white settler enacted criminalization and banishment as a response to any resistance to the Anglo-colonial mentality that the early founders of Phoenix sought to impose on the original inhabitants of the region. Similarly, Scottsdale was also a "sundown town" for O'odham people who were coming from the neighboring Salt River reservation.